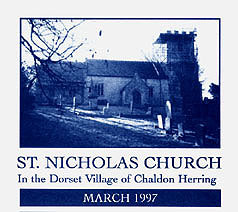 St. Nicholas church originated in Norman times, but the present building is 14th and 15th Century. The elements of the past centuries are taking their toll, and after a recent survey our architect has drawn our URGENT attention to the repair of the chancel roof, and to improving the heating system in order to preserve the internal fabric of the Church. The estimated cost of these works is £40,000. The Parochial Church Council (P.C.C.) intend to carry out this work, and a programme of fund raising events is planned for 1997/98. We are appealing for financial help in raising this amount of money. Chaldon Herring is a small community and we cannot stand bv and let our beautiful village church fall into disrepair. Donations may be sent to our Treasurer Mrs J. Watkins at the address above. If you will print the slip on the next page and return it with your donation we would be very grateful.